The Posies were formed in 1987 in Bellingham, near Seattle in Washington State, by legendary songwriters Jon Auer and Ken Stringfellow. I have been a fan of their music since the 1990s and some of my favorite songs of the decade are on one of their most popular albums, 1990’s Dear 23, including Golden Blunders, Apology, You Avoid Parties and the earthshaking epic Flood of Sunshine. The band followed this monumental album with Frosting on the Beater which also included stellar hits Dream All Day, Solar Sister and Flavor of the Month. 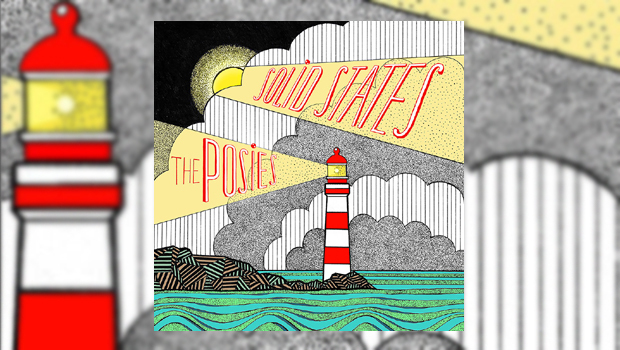 In 2016 the band return with new album Solid States, their eighth, and like the other releases this one is full of solid radio friendly tracks that show off the band’s wit and songwriting ability, crafting lines that twist tongues and fit complex ideas into melodic symphonies of heart felt passion. The album opens with an excellent example in We R Power!, an anthem of hope urging the world to wake up from its current melancholic, blasé, and apathetic state. The song strives to give power back to the people as the refrain shouts: “You wanna watch the world roll, roll over you? If we resist the final hour. We R Power!” A lightning bolt of a song, or a lighthouse (as graces the album cover), shining as a beacon to ignite passion in each individual to take action and explore how to regain control over their lives. Unlikely Places returns the band to the fun pop songs that made them a mainstay of AOR radio back in the ’90s. The groovy bass and guitars paint pictures from that Beatlesque era that I remember so well from Dear 23, only this time the lyrics are much more positive. The melody is so catchy – you know you’ve heard something similar before…somewhere. This band is like that, like they have always been around…and never left. “Yeah, I’ve been meaning to say and saying to mean”, just like they used to with lyrics. This one sounds like a great song to walk through Seattle’s Pike’s Place Market, with headphones on looking out at Elliott Bay through the windows. Likewise, Scattered is full of those excellent vocal harmonies and familiar melodies which created so many critical comparisons to the Beatles back in the ’90s. It opens with flute and soft lead guitar, bass and drums. The “anytime you want me…” harmony refrain echoes with powerful Bridge Over Troubled Waters assurances. One of the album’s best tracks. The Auer/Stringfellow songwriting school is back in session, with supreme lyrics to make you think on Squirrel VS Snake. Just try to decipher all the hidden and not so hidden messages. The melody is like a magnet and will make you want to play it repeatedly while the lyrics will force you to want to read and understand it all. As an example; “Now I’m sentenced to be petrified and I’m changing solid states”. Too many lyrical gems to discuss in one review, this song deserves a classroom discussion. Lyrics are important to The Posies and for Titanic they are deep, while the melodies and vocal harmonies keep everything light. The amazing contrast this band can create in a song makes them the perfect draw for live shows. “The pace of the waves, yeah, the form of the storm. It’s either getting colder or we’re getting warm”. Powerful musicianship matched with that Wall of Sound feel. The wonderful lyrical rhymes continue in March Climes while the melody keeps your foot pacing to the rhythm. “Somewhere upon a time, once, when we were fine” feels like a great combination of Keane and George Harrison. M Doll‘s lyrics hit home with this marketing prof; “In this dystopia of the free, a little channel for you and me”, “And when they leave you behind cuz you’re 29, what’s a girl/boy to do?” A great critique on the industry and the world in general set to another catchy melody. The Definition is another powerful expose with a great melody set to a danceable beat and some of the best musicianship on the album; “Hey now you can’t say a word when it’s more than you could mean. She’s the definition”. There’s also a fine lead guitar solo amidst the powerful supporting wall of music. The Plague opens profoundly with, “The problem with asking questions is there underneath all the tension is fear of the truth…Wondering what you want your song to be”. A powerful piece on fighting for freedom and the right to think for yourself. “I know you want silence but silence don’t buy much”, “Uncomfortable being outspoken? It’s too late when chains are choking off your resistance”. Many of the ills of the present world are on display for all to view as the band asks what we are going to do about it, the music matching the uncomfortable feeling created by the lyrics. This would be an excellent song to see played live. Rollercoaster Zen is a classic Posies song with thought provoking lyrics set to soft and fun melodies. “Beautiful friend, when I see you again there’ll be times that my mind won’t believe and dreams they will shake when they pull me awake and the sign of your times doesn’t leave”. There’s a hats off to Rush with “Moving all the pictures around, yeah, they’re always flooding over me like you’re a permanent wave – and I know you’d be sure to say…keep on keepin’ on”. (Just joking, but I couldn’t help but see the wonderful way they brought together two of their best albums within the lyrics). “Windsong – take my flesh away. “Time will make us irrelevant. All this set to dreamy piano and strings filled music in a contemplative song for Seattle on a sun filled day. You can almost see Stringfellow and Auer on the edge of the docks of Elliott Bay looking out into the waves, contemplating the future beyond this world, while at the same time experiencing one of those excellent summer days filled with the sound of gulls, salty air, the sound of waves, with soft puffy clouds overhead. “I long for completion”. Perfect. Finally to Radiance, a good closer full of uplifting lyrics but it lacks the strength and magnificence of Dear 23’s Flood of Sunshine. “Time to become what you are, there is radiance inside you”. This band is one of the few left that still possess the ability to write gripping and passionate lyrics set to melodies that hook and draw you in. You are drawn to sing along with them like few other bands I know today. Great, mind challenging lyrics coupled with excellent melody; that is where it all began with the Beatles. The Posies have never forgotten the keys to making memorable music and this is one of the best albums of 2016. Although it is in no way a traditional prog album, it will make you think and in that sense I think it is progressive in its own way of refining and re–orchestrating the essential power The Beatles laid out so many years ago, that music can move you and change lives, and ultimately the world.